Can you see the symbols in the Armada portrait of Queen Elizabeth I? Home What's On Can you see the secret symbols in the Armada portrait? The Armada Portrait of Elizabeth I is returning to the Queen’s House at Greenwich after extensive conservation treatment. Some 425 years after it was painted in the early 1590s – and as the result of a public appeal that raised £10.3 million, including £7.3 million from the Heritage Lottery Fund (HLF) – the Armada Portrait entered public ownership in 2016. After brief initial display in the Queen’s House last autumn, the painting has now undergone over six months of complex conservation headed by Elizabeth Hamilton-Eddy, Senior Paintings Conservator at Royal Museums Greenwich, with over 40 years’ experience in the field including on panel works of this kind. 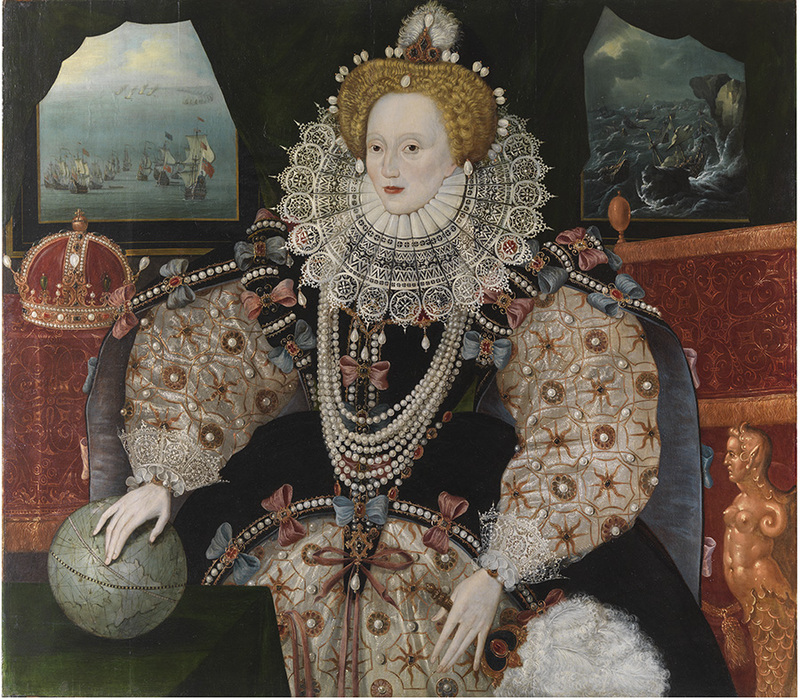 Sir Peter Luff, chair of HLF, said: “The Armada Portrait is a compelling historic icon, illustrating a decisive conflict, inspiring female leadership, maritime power and the emergence of the Elizabethan Golden Age. This image has shaped our understanding of Gloriana, the Virgin Queen, for over 400 years and I am delighted that it now has such an appropriate permanent home in Greenwich. The Armada Portrait commemorates the most famous conflict of Elizabeth’s reign (1558–1603), the Spanish Armada’s failed attempt to invade England in August 1588. Scholars have also called it a definitive representation of the English Renaissance, encapsulating the creativity, ideals and ambitions of the whole Elizabethan era. The long conservation treatment removed several layers of old varnish and retouchings, more fully revealing the painting’s intricate detail and vibrant colours. Specialist technical analysis has also provided important new information about the two background seascapes framing the figure of the Queen, and confirmed that they were repainted in the early 18th century. Both are painted over earlier versions, showing 16th-century ship types: these can still be seen in the only other complete version of the painting (by another unidentified artist) in the Bedford Collection at Woburn Abbey. Pearls – symbolising the purity of the Virgin Queen. It’s suggested they were the last gift to the Queen of Robert Dudley, her suitor for many years. Window scenes – on the left, the Armada arrives, on the right, with the Queen intervening, the Spanish invaders leave defeated. The Queen makes the difference. The globe – the Queen’s hands rests on the Americas which England was busy colonising. It signals that an English monarch’s reach was global. Pillars – the Queen is flanked by two pillars, representing the pillars of Hercules. There are a reference to the symbols of the Holy Roman Emperor, Charles V, father of Philip II of Spain, who sent the Armada. Pomegranate – on her right, over her shoulder, the egg-shaped fruit symbolised fertility, abundance, generosity, union, prosperity, rebirth, resurrection and eternal life. Mermaid – carved into the chair is a mermaid representing the destructive wiles of the female and her command of the seas. The mermaid could also represent Mary, Queen of Scots, now safely behind her. The bows – on the front of her dress – and elsewhere again represent virginity, a virtue that was akin to a giant codpiece on the portrait of a king. The Queen’s face – although 55 at the time of the portrait, she is represented as eternally youthful with her ruff appearing like the rays of a sun, her back to the storm.